FRANÇOIS HOLLANDE, President of France, addressing the Assembly for the first time since his election, said universal values were not owned by any country or individual. While they belonged to all, they were frequently trampled up in a world that was gripped by fanaticism, a stagnating global economy and climate change. The task for the United Nations was to address such challenges in a comprehensive, fair and just manner. France reiterated its deep trust in the Organization, but noted that despite all the good work that had been achieved, the United Nations had been unable to stop all war and repression. With that sobering fact in mind, he said the most effective way for the Organization to achieve its noble goals was through reform, including of the Security Council. In that regard, France supported the calls for enlargement of the Council put forward by Germany, Japan, India and Brazil. It also favoured increasing the presence of African nations, including among the body’s permanent members. Being on the Security Council was not a privilege handed down through time, he said, rather it entailed the duty to act in situations that required joint responses. One such situation was the crisis in Syria, where 30,000 people had lost their lives in the past 19 months. “How long will the United Nations be paralyzed,” he asked, adding that regardless of the international community’s inertia, one thing was certain: the current regime in Syria would never again have a place among the community of nations. With that in mind, France, he said, was taking steps to recognize the provisional Government in Syria. Meanwhile, it was urging that opposition movement to reject violence and move swiftly to address the aspirations of the people. There was also a need to stand firm against the proliferation of nuclear weapons. In that regard, for the past few years Iran had evaded the inquiries of IAEA and flouted the will of the Security Council. While he wished to see substantive negotiations on Iran’s nuclear ambitions, such talks had not yet occurred. As that was the case, France was prepared to adopt new sanctions. Iranian authorities must know that “enough is enough”; negotiations must begin in earnest before it was too late. Also on the Middle East, he urged action that would assist Israel and the Palestinians in overcoming their deadlock. “The status quo is not an answer, it’s an impasse,” he added. Turning to another pressing issue, he said occupation by terrorists of areas of the Sahel was “unacceptable”. It was a threat to the entire region and such actions by extremists must be rejected. The African Union and ECOWAS had said they were prepared to take concrete action; Malian authorities had requested the assistance of the United Nations. And, in that light, France was prepared to support any Security Council action that would bring the crisis to an end. “ Mali must regain control of its territory and terrorists must be driven from this region” he declared. On development matters, he said, among other things, that the international community must adopt a long-term response to climate change. 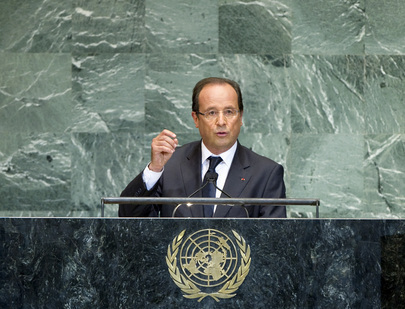 France would be ready to host a United Nations conference on climate change in 2015 so that a comprehensive climate deal could be reached. Continuing, he said that while the Rio outcome had not met the expectations of all countries, it had nevertheless pointed the way towards a more sustainable and equitable future. Still, one of the main disappointments had been that the parameters of a United Nations environmental agency had not been firmly agreed. France would continue to press for the creation of such an agency, which would be based in Africa. Finally, he said that the United Nations must lay the foundation for a world that was fair and equitable. The Arab Spring revolutions had shown that people were yearning for such a world. He called on the political movements that had emerged in the wake of those events to continue on a path of democracy and equality and to reject violence in all circumstances. Reiterating his country’s trust in the United Nations, he said that if all Member States lived up to their responsibilities, progress in those areas could be made. “When there is inertia and inaction, injustice and intolerance can take hold […] we must act and act together,” he said, urging the Assembly to do more to live up to the expectations of the world’s people.